Gogges, (pr. 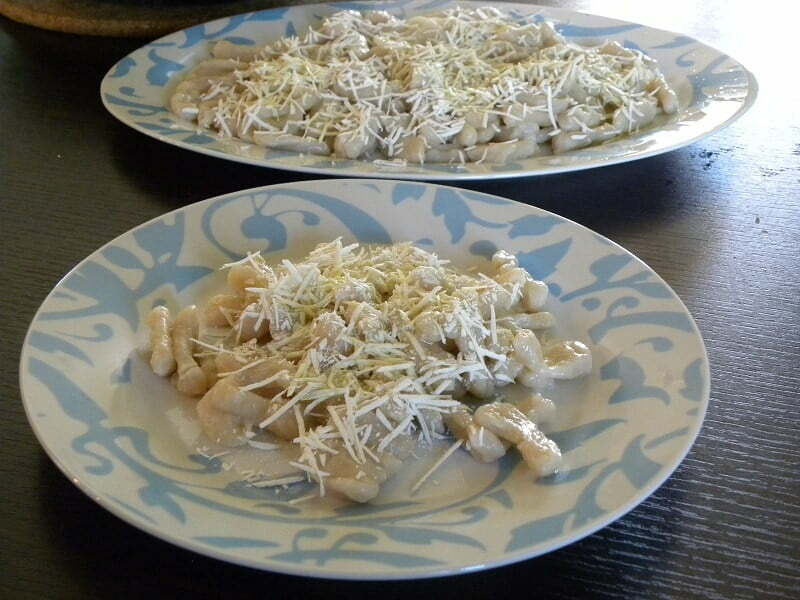 GHO-ghaes – in Greek γκόγκες), sometimes also called Goggizes, is the name of a Greek pasta and a traditional dish with the same name, from the Peloponnese. This dish is found in Argolida, where I live but also in many other parts of the Peloponnese, where Arvanites live. The Arvanites were a semi-nomadic Greek tribe, who lived in an area which was called Arvaron or Arvana, part of the Byzantine Theme or Dyrrachium, in Heperus or Epirus, a region which was annexed to Albania after the Balkan Wars. During the end of the 14th century and early 15th century, they massly immigrated to central Greece and then came to the Peloponnese, where they were mercenaries for the Despotate of Moreas, fighting alongside the last Byzantine Emperor, Constantine Palaeologos. Below is a short video of the fortress of Argos, called Larissa. During the Byzantine period, the fortress was of essential strategic importance. This dish is usually eaten on the last Sunday of Carnival, which is called Tyrini. Tyri means cheese in Greek, so on this day, any dishes with cheese in them are eaten. This dish is served with a Greek cheese called “myzithra”. The traditional way of making gogges was to measure the flour using a soup plate. For each dish of pasta they wanted to make, a plate of soup (not up to the rim) was measured, which was enough to make a serving of pasta. They would add salt and water and make the dough. Then they would then make strings and cut small pieces of dough. They worked on a well-floured surface so that the pasta would not stick to each other and with their index and middle finger they would press the dough first to flatten and then move the fingers to roll it until it twisted around to resemble a seashell. I am not 100% sure about this but I think that the word gogges or goggizes in the Arvanite dialect does mean seashell. I tried using these two fingers but I found it easier using my thumb or only the index. Alternatively, if we want to make the pasta with a design, we can use the back side of a cheese grater. Nowadays, this pasta is produced by local pasta manufacturers and sold in small groceries selling local products. The dough is made the same way as the dough for making phyllo, but without adding olive oil and vinegar. You can see the procedure of making the dough in this video. The first time I attempted making gogges seemed a bit difficult, but my husband had memories when his mother made homemade pasta and with his guidance and a little practice it got much easier. My husband and I finally finished after about half an hour. So if you are doing this alone, you will need about an hour to finish. While preparing the pasta my husband told me that his mother put them on linen tablecloths to dry. He didn’t know why but my guess is that the linen cloth absorbed moisture, so it was easier to dry them. I wanted to cook the pasta the following day, so I covered them with a linen coffee table cloth. By next day they had almost dried. If you want to preserve them for a longer period, these should be left for more days until they dry completely. This pasta is denser than usual store bought pasta, so they need about half an hour to cook. After the half an hour if they are not fork tender, let them sit in the hot water for five more minutes. To cook them, heat plenty of water, add salt, shake off the excess flour and cook them. To serve them, drain them and put them on a platter and add myzithra on top. Then heat some extra virgin olive oil (about 2 tbsp per serving) or butter and add it on top. I served them with Spetzofai. However, during Tyrini we serve them without any meat. Gogges, sometimes also called Goggizes, is the name of a Greek pasta and a traditional dish with the same name, from the Peloponnese. This dish is found in Argolida, where I live but also in many other parts of the Peloponnese, where Arvanites live. Put the flour and salt in your stand mixer bowl and attach the dough hook. Add the water gradually and mix, increasing the mixer speed as you go along. When the dough starts attaching on the dough hook the dough is ready. Cut the dough into smaller pieces. Take a piece of dough and form it into a string, about 1 cm (0.40 inch) thick. Prepare all the strings and cut them into 1 cm cubes. Press them with your index and middle finger (or thumb or forefinger) to flatten and move your fingers so that the dough goes all the way round, forming a shell shaped pasta. Put them on a well-floured surface. At this point you can cook them fresh or dry them. Heat some water and add some salt. Add the pasta and cook for thirty minutes. Keep mixing them regularly as they may stick to the bottom of the pan. Turn off the heat and let them sit in the water for five more minutes. Drain the pasta and heat the olive oil or butter. Put the pasta in a platter, add myzithra cheese, some hot olive oil and continue adding pasta, myzithra and olive oil until all have been added. Homemade pasta sore sure tastes way better and fresher than the storebought. Have never had Greek pasta or Goggizes…looks really tasty, Ivy.